Paradise doesn’t come cheap. 90% of everything is imported into the Bahamas, mostly from the U.S. Food, building materials, fuel, you name it. While there is some farming, the soil doesn’t really lend itself to high output. There is fishing of course, but boats are expensive, fuel is over $5.00/gallon & some species are in decline (especially their famous conch). 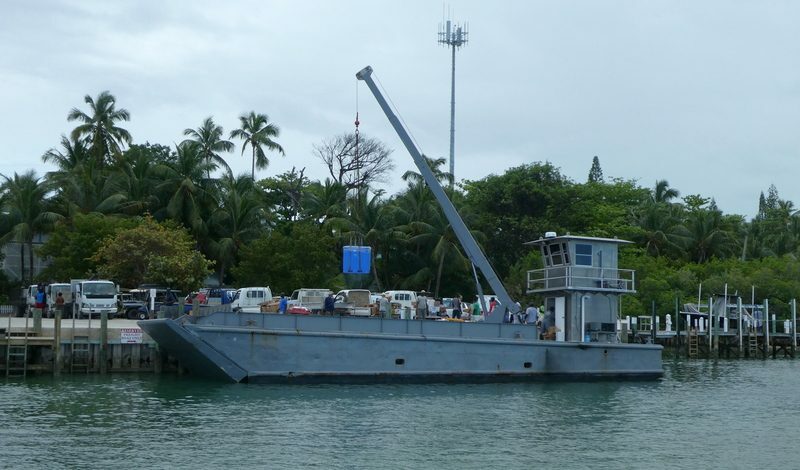 Importing & delivery to the smaller islands is even more expensive as the larger ships from Florida can’t arrive directly – everything has to be off-loaded to Nassau or elsewhere, then re-loaded onto smaller boats/ships which can enter & dock into a smaller harbor & taken off with booms into small trucks, pickups or golf carts. Delivery day in Hope Town, Abaco. 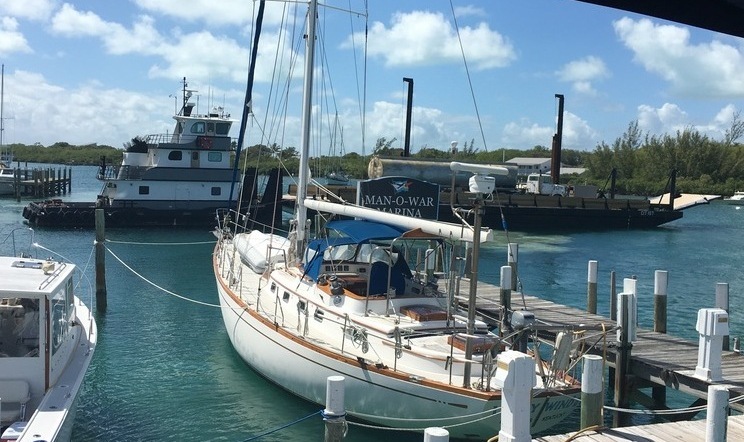 This freight boat makes about 3 trips a week from nearby Marsh Harbour, while much of the northern Exumas, for example, receives their freight by old “mailboats” only 3 times a month, coming all of the way from Nassau. This fuel came a long way – starting in the U.S. (or Central America?) via a large tanker, then a smaller tanker to Abaco, then onto a tanker truck driven onto a work barge piloted by tug into this marina. No wonder diesel is over $5.00/gallon. How expensive? Double is a good rule of thumb, but triple or more is not unusual. Why so much? Tacked onto the cost of goods from Florida is obviously the cost of transport by ship from Florida, freight & custom brokers, plus an average 30% Bahamian government import tariff. The smaller “family” islands have the additional cost of intermediate boats/ships to get to their island along with the increased cost of smaller volume. 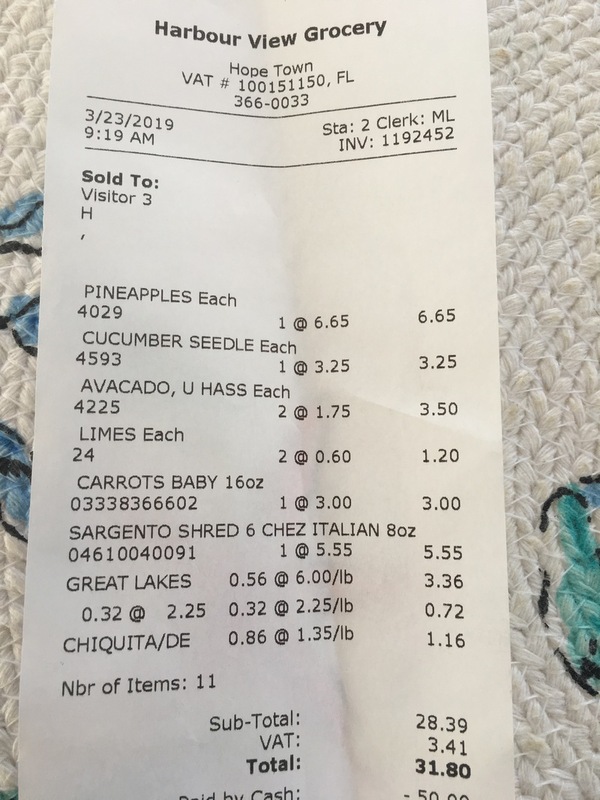 Probably our smallest grocery store receipt all winter. As if that isn’t enough, in 2014 the Bahama government instituted a 7 1/2% VAT on everything (even food). Last year the VAT was increased to 12%! Remember – this is 12% on the inflated Bahamas pricing, so effectively over 20% based on U.S. prices. While they’re calling it a “value added tax”, it seems similar to a sales tax on everything at the retail level – many services too. Fortunately, they have lowered or eliminated the import tariffs on some items, but most items still have tariffs from 5% to 50%+. The only food concession they made is making about a dozen foods VAT exempt – not food groups – a dozen basic foods. Of course, I can’t really complain – we only spend a few months here & have more resources than 95% of Bahamians. But how does the average Bahamian cope? It’s particularly concerning as their economy relies primarily on tourism. Currently the U.S. economy is robust & tourism to the Bahamas is up, but what will happen when the next major U.S./Canadian recession hits? This is a very informative commentary. I too have been somewhat shocked at the way the Bahamanian government has been able to simply drop these HUGE taxes on everyone who is in the Bahamas, tourists and citizens alike. In my inquiries with the Bahamians themselves I find that most seem rather passive about it which surprises me. One would think that being a rather small country the ‘voice of the people’ could be more easily heard than in a place like the US and that this would inspire those affected to ‘speak up’. When you think about how much money these taxes must produce it’s also surprising that there is little apparent return to the people themselves, i.e. – the overall condition of the Bahamas is definitely more 3rd world than 1st. So where is all the money going anyway? After all they don’t have a military to support, there isn’t a social security system and their medical care system (although covering everyone) is quite lightweight in what it provides. My guess is that there are probably a small group of ‘insiders’ in Nassau who are socking away millions in foreign bank accounts. Having heard for most of my life about the corruption in small countries throughout the world is one thing. But actually seeing what it looks like up close is rather disturbing. Ross you raise good points. Basically, the Bahamian Govt wishes to improve their bond rating and avoid fiscal crisis. Hope they are successful and citizens benefit along the way. We hope for the best.